Mercury is small, fast and close to the sun, making the rocky world challenging to visit. Only one probe has ever orbited the planet and collected enough data to tell scientists about the chemistry and landscape of Mercury's surface. Learning about what is beneath the surface, however, requires careful estimation. After the probe's mission ended in 2015, planetary scientists estimated Mercury's crust was roughly 22 miles thick. One University of Arizona scientist disagrees. Using the most recent mathematical formulas, Lunar and Planetary Laboratory associate staff scientist Michael Sori estimates that the Mercurial crust is just 16 miles thick and is denser than aluminum. His study, "A Thin, Dense Crust for Mercury," will be published May 1 in Earth and Planetary Science Letters and is currently available online. Sori determined the density of Mercury's crust using data collected by the Mercury Surface, Space Environment and Geochemistry Ranging (MESSENGER) spacecraft. He created his estimate using a formula developed by Isamu Matsuyama, a professor in the Lunar and Planetary Laboratory, and University of California Berkeley scientist Douglas Hemingway. Sori's estimate supports the theory that Mercury's crust formed largely through volcanic activity. Understanding how the crust was formed may allow scientists to understand the formation of the entire oddly structured planet. 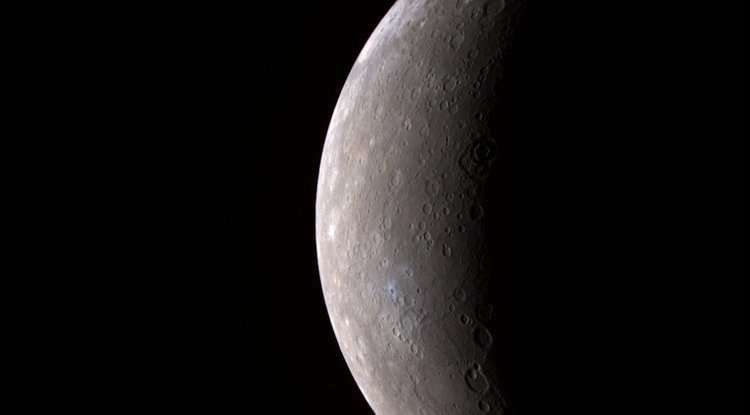 "Of the terrestrial planets, Mercury has the biggest core relative to its size," Sori said. 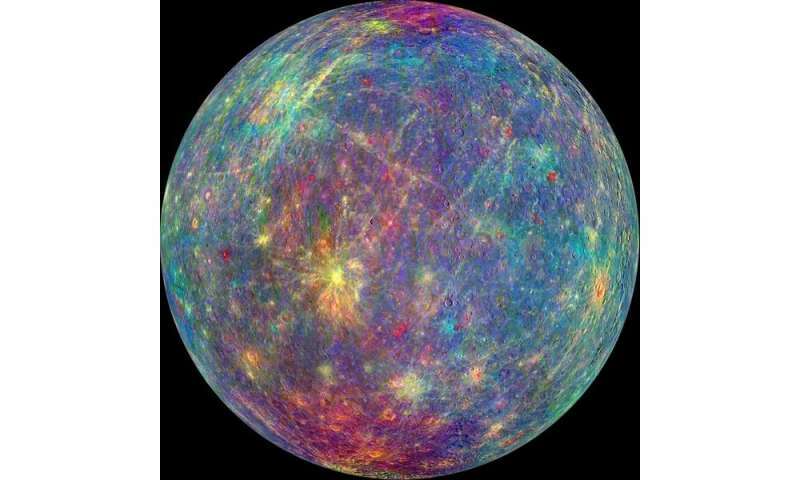 Mercury's core is believed to occupy 60 percent of the planet's entire volume. For comparison, Earth's core takes up roughly 15 percent of its volume. Why is Mercury's core so large? "Maybe it formed closer to a normal planet and maybe a lot of the crust and mantle got stripped away by giant impacts," Sori said. "Another idea is that maybe, when you're forming so close to the sun, the solar winds blow away a lot of the rock and you get a large core size very early on. There's not an answer that everyone agrees to yet." Sori's work may help point scientists in the right direction. Already, it has solved a problem regarding the rocks in Mercury's crust. The United States Geologic Survey released this topographic map of Mercury in 2016. The highest elevations are colored red, and the lowest elevations are colored dark blue. When the planets and Earth's moon formed, their crusts were born from their mantles, the layer between a planet's core and crust that oozes and flows over the course of millions of years. The volume of a planet's crust represents the percentage of mantle that was turned into rocks. Before Sori's study, estimates of the thickness of Mercury's crust led scientists to believe 11 percent of the planet's original mantle had been turned into rocks in the crust. For the Earth's moon – the celestial body closest in size to Mercury – the number is lower, near 7 percent. "The two bodies formed their crusts in very different ways, so it wasn't necessarily alarming that they didn't have the exact same percentage of rocks in their crust," Sori said. The moon's crust formed when less dense minerals floated to the surface of an ocean of liquid rock that became the body's mantle. At the top of the magma ocean, the moon's buoyant minerals cooled and hardened into a "flotation crust." Eons of volcanic eruptions coated Mercury's surface and created its "magmatic crust." Explaining why Mercury created more rocks than the moon did was a scientific mystery no one had solved. Now, the case can be closed, as Sori's study places the percentage of rocks in Mercury's crust at 7 percent. Mercury is no better than the moon at making rocks. Sori solved the mystery by estimating the crust's depth and density, which meant he had to find out what kind of isostasy supported Mercury's crust. The most natural shape for a planetary body to take is a smooth sphere, where all points on the surface are an equal distance from the planet's core. Isostasy describes how mountains, valleys and hills are supported and kept from flattening into smooth plains. There are two main types isostasy: Pratt and Airy. Both focus on balancing the masses of equally sized slices of the planet. If the mass in one slice is much greater than the mass in a slice next to it, the planet's mantle will ooze, shifting the crust on top of it until the masses of every slice are equal. Pratt isostasy states that a planet's crust varies in density. A slice of the planet that contains a mountain has the same mass as a slice that contains flat land, because the crust that makes the mountain is less dense than the crust that makes flat land. In all points of the planet, the bottom of the crust floats evenly on the mantle. Until Sori completed his study, no scientist had explained why Pratt isostasy would or wouldn't support Mercury's landscape. To test it, Sori needed to relate the planet's density to its topography. 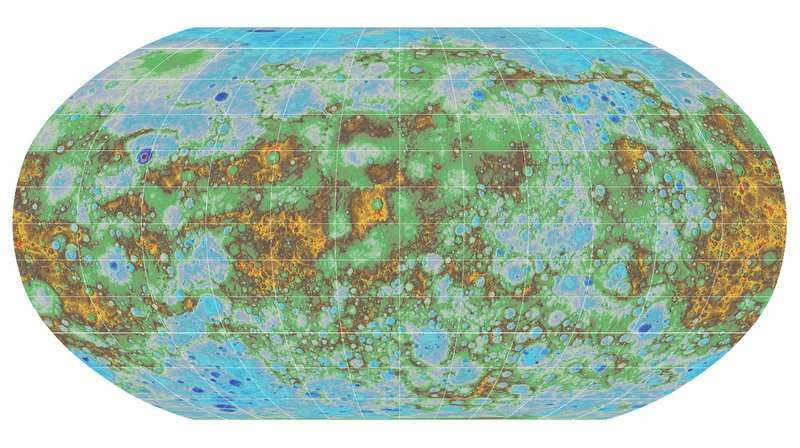 Scientists had already constructed a topographic map of Mercury using data from MESSENGER, but a map of density didn't exist. So Sori made his own using MESSENGER's data about the elements found on Mercury's surface. "We know what minerals usually form rocks, and we know what elements each of these minerals contain. We can intelligently divide all the chemical abundances into a list of minerals," Sori said of the process he used to determine the location and abundance of minerals on the surface. "We know the densities of each of these minerals. We add them all up, and we get a map of density." Sori then compared his density map with the topographic map. If Pratt isostasy could explain Mercury's landscape, Sori expected to find high-density minerals in craters and low-density minerals in mountains; however, he found no such relationship. On Mercury, minerals of high and low density are found in mountains and craters alike. With Pratt isostasy disproven, Sori considered Airy isostasy, which has been used to make estimates of Mercury's crustal thickness. Airy isostasy states that the depth of a planet's crust varies depending on the topography. "If you see a mountain on the surface, it can be supported by a root beneath it," Sori said, likening it to an iceberg floating on water. The tip of an iceberg is supported by a mass of ice that protrudes deep underwater. The iceberg contains the same mass as the water it displaces. Similarly, a mountain and its root will contain the same mass as the mantle material being displaced. In craters, the crust is thin, and the mantle is closer to the surface. A wedge of the planet containing a mountain would have the same mass as a wedge containing a crater. "These arguments work in two dimensions, but when you account for spherical geometry, the formula doesn't exactly work out," Sori said. The formula recently developed by Matsuyama and Hemingway, though, does work for spherical bodies like planets. Instead of balancing the masses of the crust and mantle, the formula balances the pressure the crust exerts on the mantle, providing a more accurate estimate of crustal thickness. Sori used his estimates of the crust's density and Hemingway and Matsuyama's formula to find the crust's thickness. Sori is confident his estimate of Mercury's crustal thickness in its northern hemisphere will not be disproven, even if new data about Mercury is collected. He does not share this confidence about Mercury's crustal density. MESSENGER collected much more data on the northern hemisphere than the southern, and Sori predicts the average density of the planet's surface will change when density data is collected over the entire planet. He already sees the need for a follow-up study in the future. The next mission to Mercury will arrive at the planet in 2025. In the meantime, scientists will continue to use MESSENGER data and mathematical formulas to learn everything they can about the first rock from the sun. While Mercury's orbital eccentricity and inclination are quite high compared to all other planets in the Solar System, they're far from enough to even remotely suspected it is a captured body itself. Mercury is not really that close to the Sun. It is 40 Sun diameters away. If the Sun were an orange then Mercury would be a grain of sand 10 feet away. Mercury is about 1/3 of the distance to the Sun as the Earth is so the Sun in Mercury's sky is only be about 3 times the size as seen from Earth. Of course that means it receives 9 times the intensity of sunlight hence why it is so hot, not because it is really, really, close. The reason people think Mercury is really close is because of the photos when it is in transit. But all these really tell you about is the relative size of the Sun and Mercury and not how far apart they are.